Two motor park miscreants, popularly known as agberos, Adegoke Adewale and Ganiyu Idowu, have been arrested by operatives of the Rapid Response Squad, RRS, of Lagos State Police Command, while they were stuffing N1.548 million, money abandoned by fleeing robbers in Oshodi area of the state. The suspects, Vanguard learned, were among other miscreants who pretended to be helping the police in chasing three armed robbers who snatched about N3 million from a yet-to-be identified bank customer in Oshodi. The robbers dropped their loot in a compound and the suspects stole and stuffed into their private parts. Vanguard also gathered that some RRS operatives, who were near the scene of the robbery, chased the robbers leading to the arrest of one of them, while two others escaped on foot. Meanwhile, the miscreants and recovered loot have been transferred to Makinde Police Station in Oshodi. Also recovered along with the loot were three cheque booklets of Diamond and Zenith banks, several signed and counter-signed cheque leaves. Reacting to the incident, Lagos State Police Public Relations Officer, Superintendent of Police Dolapo Badmus, assured that police will apprehend the fleeing robbers. 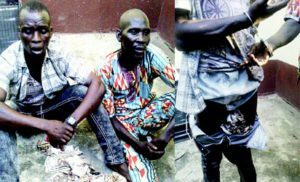 1 Response to "JUST IN: 2 Men Caught Stealing N1.548m Abandoned By Fleeing Robbers (Photo)"